There are few things in life as nice as sitting back and relaxing in your favorite RV recliner. Whether it is to ease the ache of your body, unwind from a long day, or just to watch a movie comfortably nothing beats a recliner. Some of us crave the wilderness. We just want to be unplugged from work. We want to enjoy the scenery of nature without the worry of business meetings or emails. That is why we invest in the RV. The only real downside of the RV is that sometimes the furniture isn’t really that comfortable. However, if you are looking for a compromise, you only need to put a recliner that is made for the space. A RV recliner can be an expensive investment, so here are the top three – reviewed by us. You will love the streamlined clean look of this recliner. It makes every space feel comfortable and home like. It is made of PU black leather that will blend into any décor without over dominating the entire space. It does not need any power at all. All you need to do is pull the handle back. The bonus of this RV recliner is that it is slender than the standard sizes. This allows it to set in virtually any space that you would like. The comfort level of this recliner is unmatched. Easily extends into a full laying position without power. The chair is not cramped when it is in the sitting position. Is the perfect size to fit in your RV without overpowering the space. Buy Teyana Red Leather Recliner Today! You will need to assemble this RV recliner. PU leather is not actual leather. It is plastic. The springs are tight and therefore can be difficult to push down when you want to sit back up. This is a very good recliner. It fits very easily into small spaces, like most RV recliners. It is easy to clean. It is easy to work. The fact that it does not need to be plugged in makes it more versatile than most other RV recliners. It could use some upgrades, like more cushioning or a cup holder, but if you added extras it would take away from its small size. If you have a tight space and want to add a little comfort, you will love this recliner. Whether you are sitting down, laying back, or somewhere in between this is just a good RV recliner. The best part of this RV recliner is that you only need one foot of clearance in order to recline fully. It is designed to have modules that are easy to install inside your RV. It is easy to install in about five minutes. The polyurethane finish mocks leather while still being easy to clean and disinfect. It reclines with the push of the handle and sits back up without too much force. Easy to assemble in under five minutes within small spaces. Doesn’t need a power source. It swivels to make it easy to get in and out of. It is bigger than other RV recliners which can make it hard to fit in tight spaces. The polyurethane is sticky and your skin sticks to it. Buy RecPro Glider RV Recliner Chair Today! This is a great recliner. It fits into just about any space. You can order it online and have it shipped which helps to fit it easily into your budget. It comes in modules so that they are easy to set up and put into place, even in small spaces like your RV. You will love the comfort and ease of using it, as long as you can get past the larger size. Finally, a low maintaince recliner that is ideal for RV’s because it is easy to maintain. The upholstery is made up of PolyHyde. It is a durable material that is both easy to clean and durable. 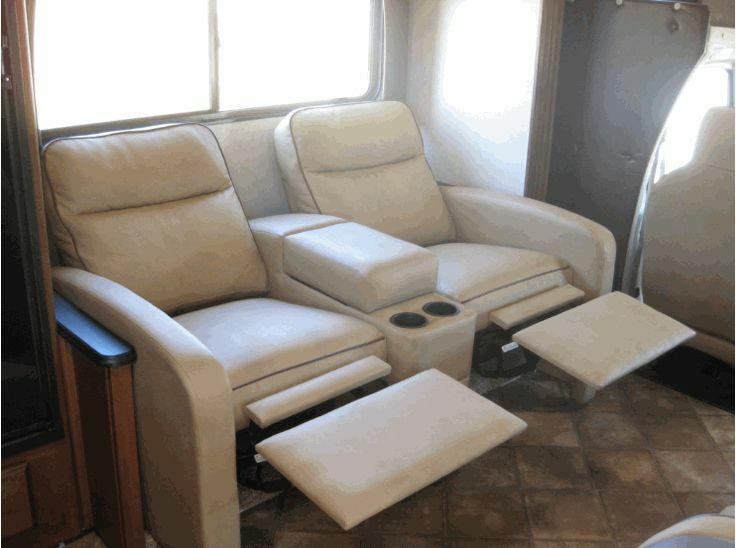 While it is larger than most RV recliners, it is smaller than a full size recliner. The assembly is really easy to do and needs no tools. It is perfectly streamlined to sit anywhere you want to put it. It is a great size to be just the right size for small spaces. It is easy to maintain without having to purchase special cleaning supplies or companies. It is large enough to be comfortable and cushioned enough to be relaxing. It needs quite a bit of wall clearance in order to recline fully. The stitching makes places where crumbs catch making it in need of cleaning more often. While it is easy to assemble inside the RV, the packaging that it comes in makes it difficult to remove it from in the RV. Buy Thomas Payne Majestic Push Back Recliner Today! The overall features of this RV recliner make this a great recliner for just sitting back and taking in the view. You can easily assemble it without having to purchase any tools, it literally snaps into place. You will like the way that it kicks back with ease. When you want to sit back up, just push in with your feet. There is no simpler RV recliner available to purchase. So of the three, it has to come down to which one stands above the rest. The reason it seems so much better than the other two is because it is just the right size to make your RV really feel like your home away from home. choice is the Teyana Red Leather Recliner Club Chair because it is so easy to recline. It is easy to clean. It is easy to assemble. There are a few flaws, but they are easy to overcome. You will want this to be your RV recliner for many years to come. So go ahead and order yours now, you will not regret the decision.